Educational and fun? There is there such a thing would you believe. The Oregon Scientific SmartGlobe. This is a welcome addition to the Blogging Beautifully household. Recently Alfie has become very much wanting to know about the world we live in, countries and most importantly which reptile resides where. This is a very important thing to a reptile mad 5 year old! You want to know where a particular snake lives just ask my son. 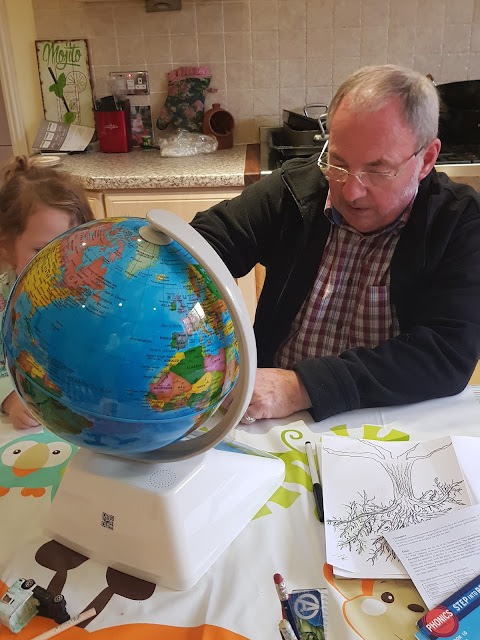 His knowledge amazes me and now using this brilliant globe he can actually visualise where these countries actually are. The SmartGlobe is an impressive piece of kit. 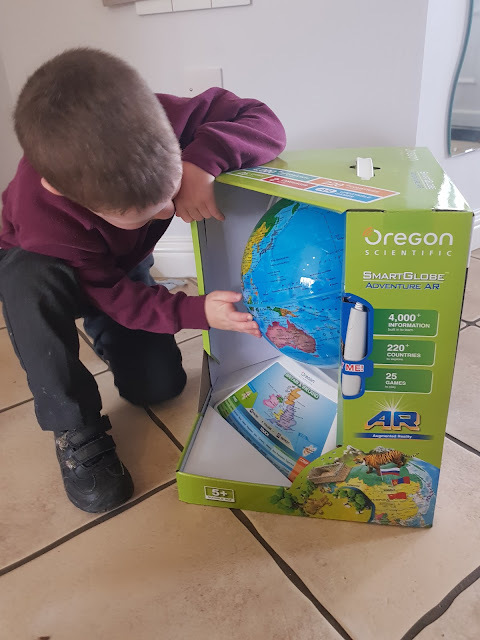 I'm not sure I can describe it as a toy as such, I mean it's played with yes, but I see it more as an educational resource if I'm honest, yes it's fun and it's so much more than 'just a' globe but fundamentally it's an interactive learning aid. I tell you what I love about it, not only did it capture my 5 year olds attention but my 2 year old also enjoyed it as did my 70 year old Dad. It appeals to wide age range even though the recommended age is from 5 years. The SmartGlobe consists of a SmartPen handily attached to the globe itself so no going walkies and losing it, a beautifully smooth and shiny globe interface, it spins (obvs), has an interactive touch pad and AR (augmented reality).......it's all the rage don't you know. So now I've whet your appetite let me talk you through what this fab piece of kit does. So as I mentioned above the interactive touch pad is where most of the interaction happens. 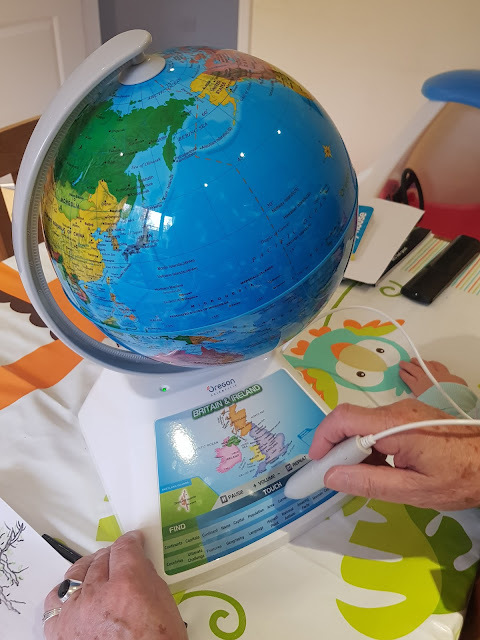 You can use the SmartPen on the globe itself where it will 'talk' to you and tell you the countries. You have to be fairly specific with where you touch the pen for it to work but this is a minor detail. There are a variety of things you can do with SmartGlobe, there really is so much more to it than just being a sphere. 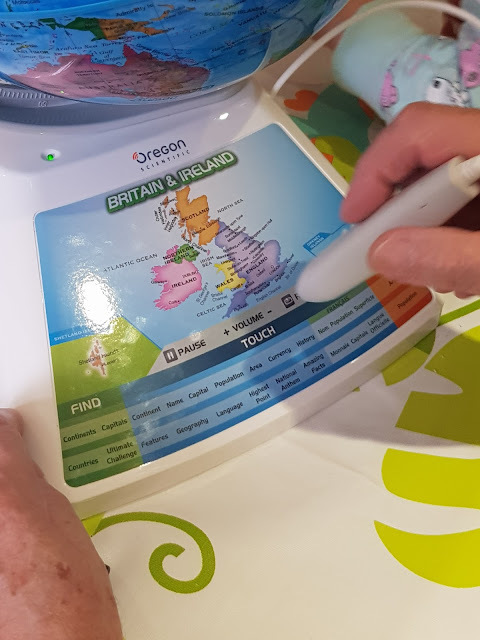 To learn about a specific country the SmartPen is used to touch any of the 'touch' categories on the activity panel, then the pen can be used to point to a place on the globe to learn more about that particular country then the pen can be used again to touch a different activity on the panel and touch the country again. I think this makes it sounds quite confusing but it's a case of just touching the panel and then globe and back to touching the panel again changing the activity. Playing a find game. This was my favourite (and my Dads) feature of the SmartGlobe. The globe will tell you to find certain places and you must answer the questions as quickly as possible. Each of these activities has 3 different levels and for each level the player must answer a required amount of questions correctly. The ultimate challenge was lots of fun, especially when me and my Dad became a tad competitive! We also enjoyed just finding the countries as quickly as we could, not as easy as I thought.....clearly need to work on my Geography skills! 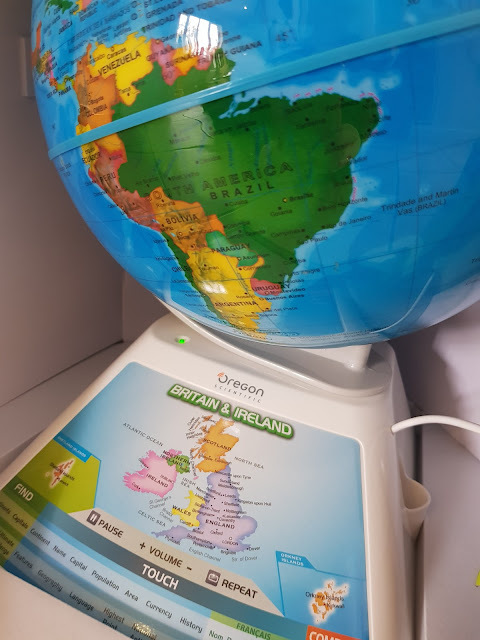 - Good job we have the SmartGlobe! By using the SmartGlobe app in conjunction with the the globe really does bring it alive. Discover what animals live where, dinosaurs that used to roam the country, popular landmarks and landscapes are featured aswell. It really is brill! 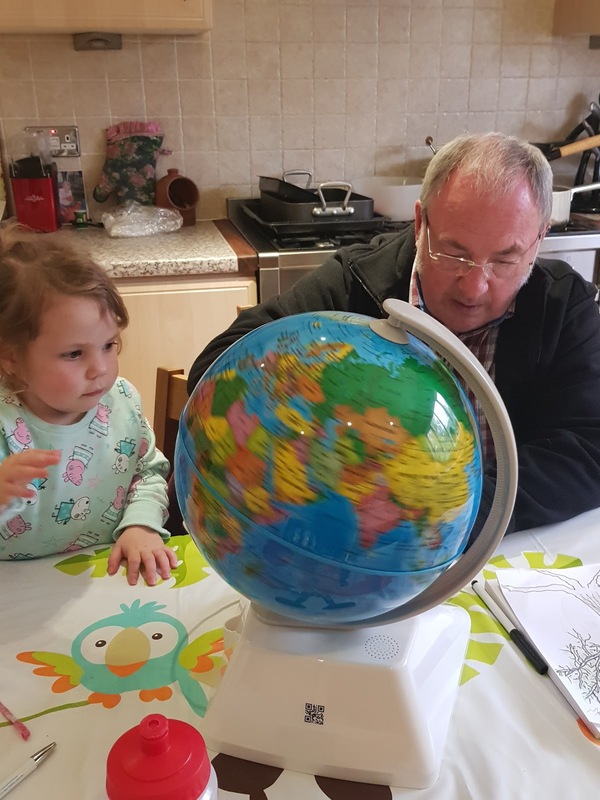 We really do love the globe, it's really fun learning and seeing the kids being interested in something that can be at times a little dull. 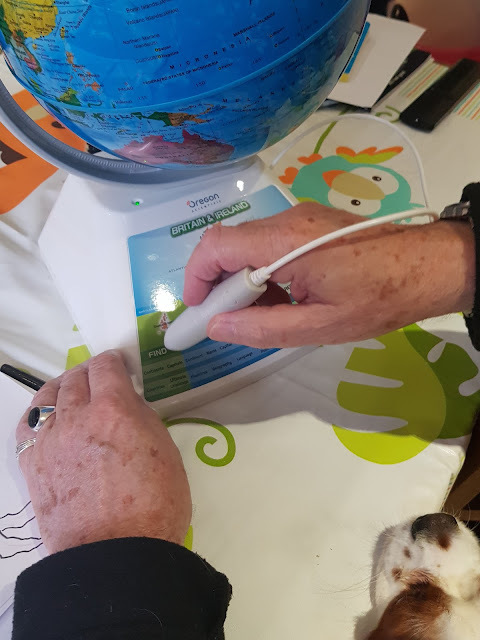 There are so many possibilities when using the SmartGlobe that it really has maintained there interest, especially Alfie. The only thing I've found that has been a little irritating is the kids discovering the music that's played when the countries are tapped, oh my word I cannot tell you how many times I have heard the dulcet (or not so) tones of Russia or the USA......google it, I dare you! I have heard many a tunes from the globe over the past few days. 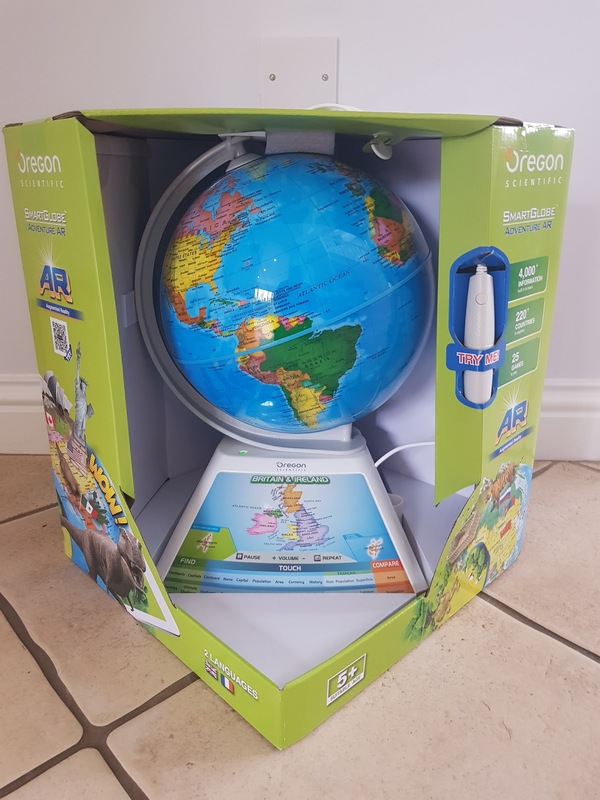 The SmartGlobe is by Oregon Scientific and retails for £59.99. There are other types featured in the collection which you can check out using the link above. 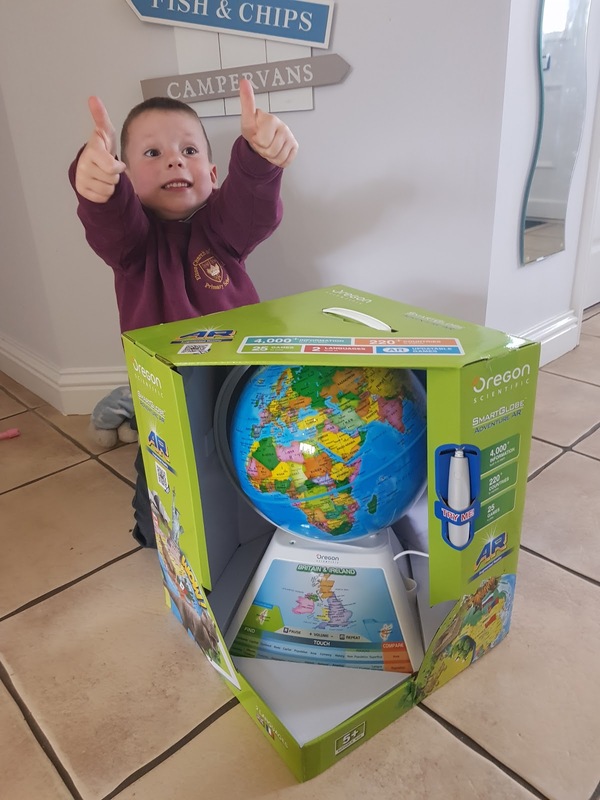 I can highly recommend this if you have a child fascinated by the world and wants to find out more or simply needs to improve their Geography skills, it will keep them entertained and I can guarantee they will enjoy learning through play. * Please note I was kindly gifted the globe free of charge in exchange for an honest review, all thoughts and opinions are my own.